1. Preheat oven to 400 degrees. Coat a baking pan with cooking spray. 2. Combine buttermilk, eggs, relish, mustard and Tabasco in a bowl. 3. In a large bowl, using a whisk, mix together flour, cornmeal, sugar, baking powder, salt and baking soda. Stir buttermilk mixture into cornmeal mixture to combine; let stand about 5 minutes until mixture is thick. Using a whisk again, whisk mixture until smooth; transfer to a tall measuring cup. 4. Cut each hot dog into three pieces crosswise. Dip dogs into batter, coating entirely. It gets a little messy but just make sure they are all fully coated. You might need to use your finger to smear the batter around. It doesn’t matter if they don’t look perfectly shaped. Mine don’t but still taste great. 5. 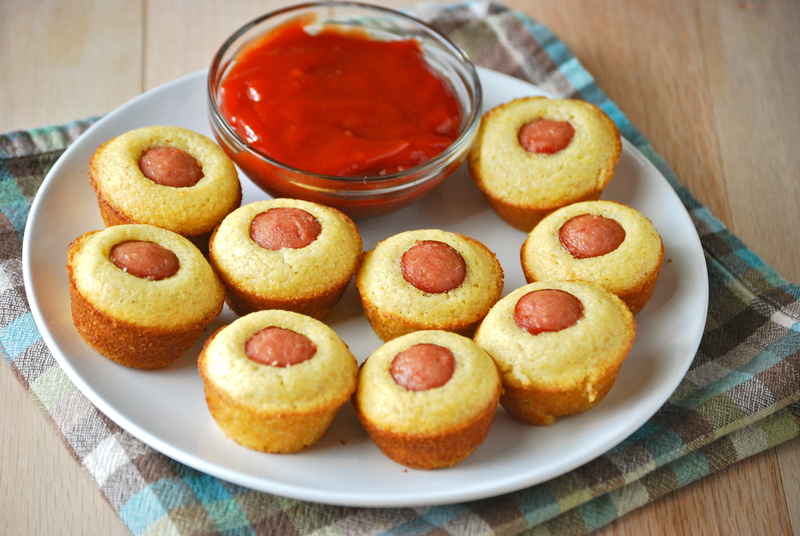 Place corn dogs on baking pan. Spray the corn dogs with cooking spray. 6. Bake for 15 minutes on 1 side, turn over, coat again with cooking spray and bake an additional 10-15 minutes. 7. Place a toothpick in each. Serve at once with ketchup and mustard on the side.